We pride ourselves on providing our clients with the very best in service. Known in the industry as the ‘skin experts’, we believe that successful skincare treatment and prescriptions come from our beauty therapists’ thorough knowledge and understanding of the skin. Your personal diagnosis using the Visia Digital Skin Analysis Scanner or camera is the key to the Beaute approach to skincare prescription. This unique diagnostic system identifies problem areas of your complexion allowing for a customised treatment program that specifically targets these areas. Visia is the first diagnostic tool to measure oil, wrinkles, UV damage, pores, spots and redness. 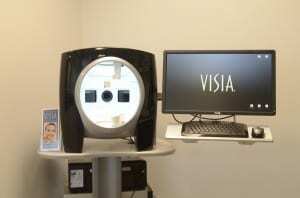 The Visia captures a multi-dimensional image. Using state of the art technology it then assesses the information providing a detailed report. This is an accurate way to visually measure improvements in your skin through a course of facial treatments. Visit Beaute for your skin diagnosis using the Visia Digital Skin analysis Scanner. This service is COMPLIMENTARY prior to any skin care treatment or program.